Robotiko Rejekto is a musical project by RaHen, one of the leading composers and producers of the Frankfurt electronic scene. He was involved in producing projects like Moskwa TV, as well as debut albums from Leatherstrip, Armageddon Dildos and many. Along with this work was Robotiko Rejekto. With its origins going all the way back to the 1980's RR has developed into a serious EBM dance project with fans from all over the world. With the album Corporate Power, RaHen mixes his retro roots as he blends the machismo of classic early EBM and the modern musical impulses of Alternative / Crossover and Electro. 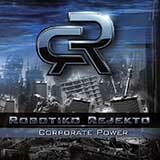 Lyrically, Robotiko Rejekto uses music to take a stand and speak out against what he refers to as "triple oppression": suppression based on sexual, ethnical and class specific affiliation (sexism, racism, classism). A highly danceable blend of the old school scene and new, Corporate Power is a compelling addition to the genre.